Recycle, reuse, repurpose, upcycle, are not just buzz words but a movement in the world of crafting. Many of the Boston Handmade artists use salvaged, recycled, and repurposed materials to make their creations. These unique works of art are not only beautiful but have some sort of environmental awareness to them. 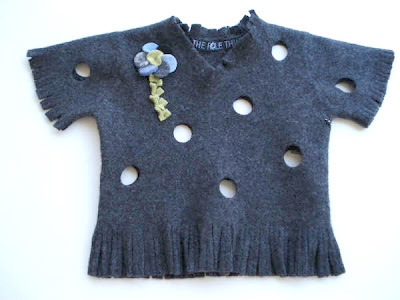 "My sweaters and accessories are all made from recycled sweaters. I also use old buttons almost exclusively and also fabrics from my clothes and my kid's & husband's clothes that I have loved & saved over the years. In the office I try to reuse paper by printing on the other side if possible and I also reuse shipping boxes when I send orders out to Etsy customers and stores. In general I try my hardest to lead a very environmentally conscious & minimalist life. I am much more of an investor than a consumer. Consumers feel better when they buy things - investors feel better when they save money (and energy). When I run a handful of errands I try to get them done in a fashion that uses the least amount of gas. When I am home I always turn out the light if I am not in the room. I keep the thermostat at 68 degrees and put a sweater on if I am cold. It's the little things that all ad up to make a big difference. See my Go Green and Treading Lightly on the Earth posts on my blog for more info." 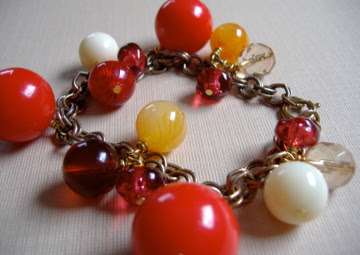 Using all vintage materials, Lisa from Glamourpuss Creations uses broken pieces or buys separate vintage components to make jewelry. "Reusing chain, beads, clasps, buttons and even, in most cases, head pins and ear wires, from vintage materials means I'm recycling too! I usually don't deconstruct vintage jewelry that is all intact - I like to preserve those items as is because they're so precious and rare!" Jessica from Reclaimed To You says, "I do reuse materials, and use found and old and used materials in my work but I never thought of it as truly 'green', but I suppose it is. The reason I am prone to going green in my life and my art is because of an overall desire to make less of a 'carbon footprint'. I like the idea of finding ways to incorporate something that already exists into my artwork instead of having it go into a landfill. I'm glad when I don't have to constantly drive to an art supply store to buy chemicals and synthetic materials because I have found more natural ways to collage and found ways to make my work from what I have in my immediate vicinity. If I can use what I already have in my home and studio to make art, and not buy anything new than it is a successful day." Having used materials found around me out of necessity (since childhood), I have developed a sense of being aware of my environment. There is so much consumerism in this country and disposable items that it seems a waste of resources for them to just get thrown away. Gathering materials from my everyday life, that would normally just get thrown away, become resources I store until I can determine what to make from them. Most of the ideas that I come up with come from the materials themselves. Paper cut offs, plastic plate material, and detris become journals. Fabric sample books become a feast of colorful scarves and toilet roll tubes become handmade paper books. Creativity can stem from the simplest of materials. If we all just think about an item before discarding it we might be able to change the world.